First up is the Fan Favorites Duo. 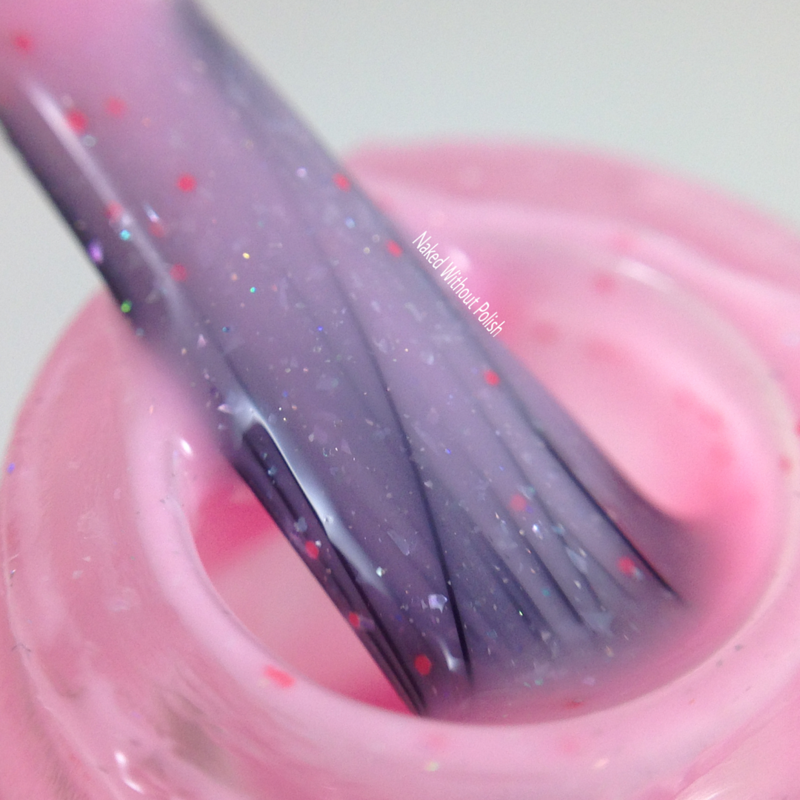 Melty Ice Cream is described as "a pale, bleached, neon pink crelly with rainbow shimmer, a dusting of holo pigment, and pink micro glitter". Shown is three thin coats of Melty Ice Cream with top coat. 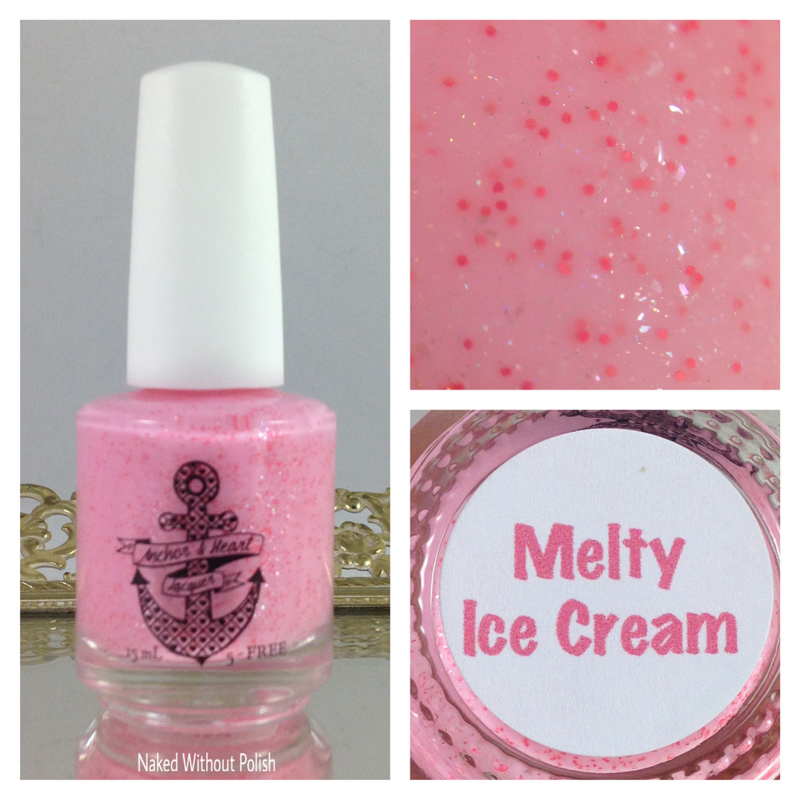 Melty Ice Cream is one pink beauty you won't mind on your fingers. Just keep it on your nails. It may not be sticky like ice cream, but it's definitely not as easy to get off. First coat was a tad bit streaky, but evened out after the second and became fully opaque after the third coat. 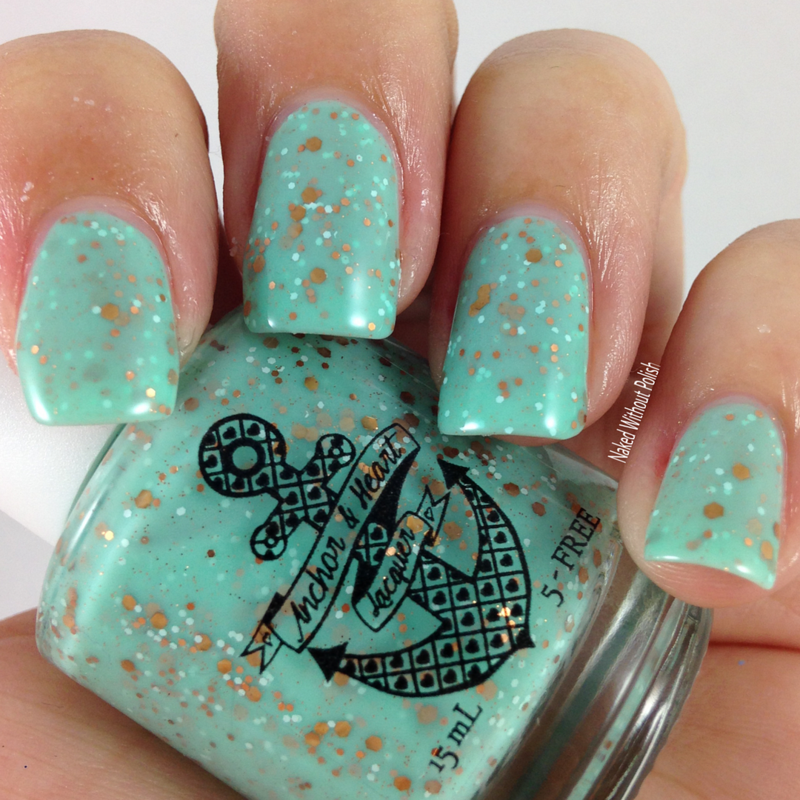 There is nothing to dislike about this polish. 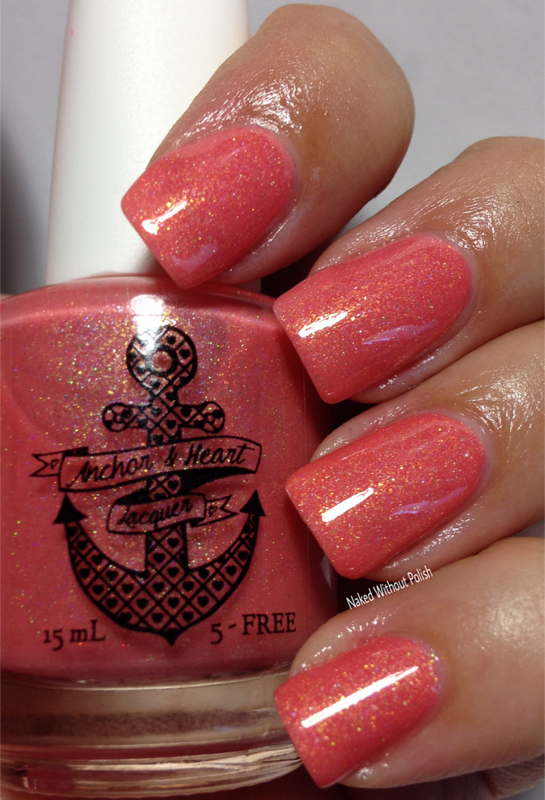 The perfect spring pink! 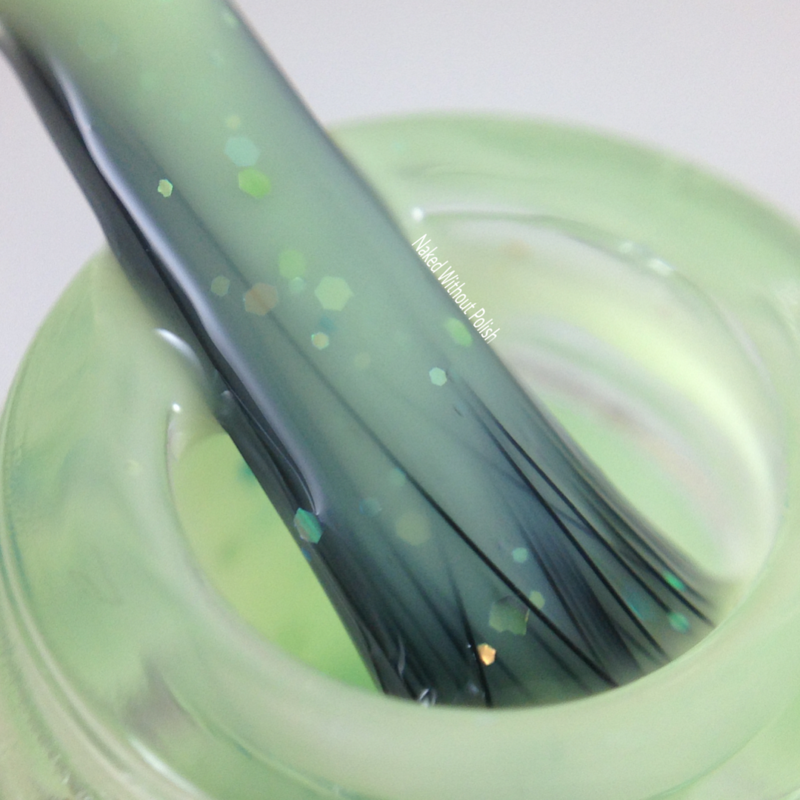 Lime Berry Slushie is described as "a bleached neon lime green crelly with iridescent green micro glitter, a speckling of matte and holo blue glitter in different shapes and sizes". Shown is three thin coats of Lime Berry Slushie with top coat. Lime Berry Slushie is green perfection! 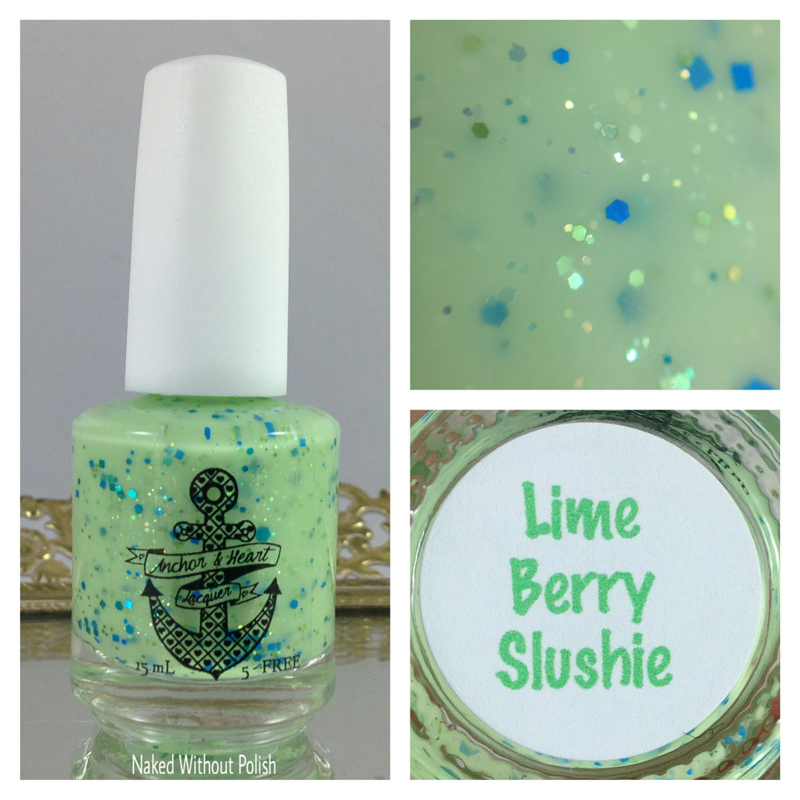 If you've ever looked at a key lime pie and said I need a polish THAT color, this is your polish...with the added beauty of some blue and green glitter. Same gorgeous formula and application as Melty Ice Cream. These two make the perfect sweet treat pair to keep you happy over the summer. 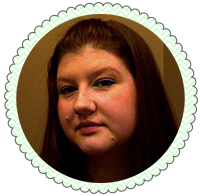 You won't want to miss out on them! 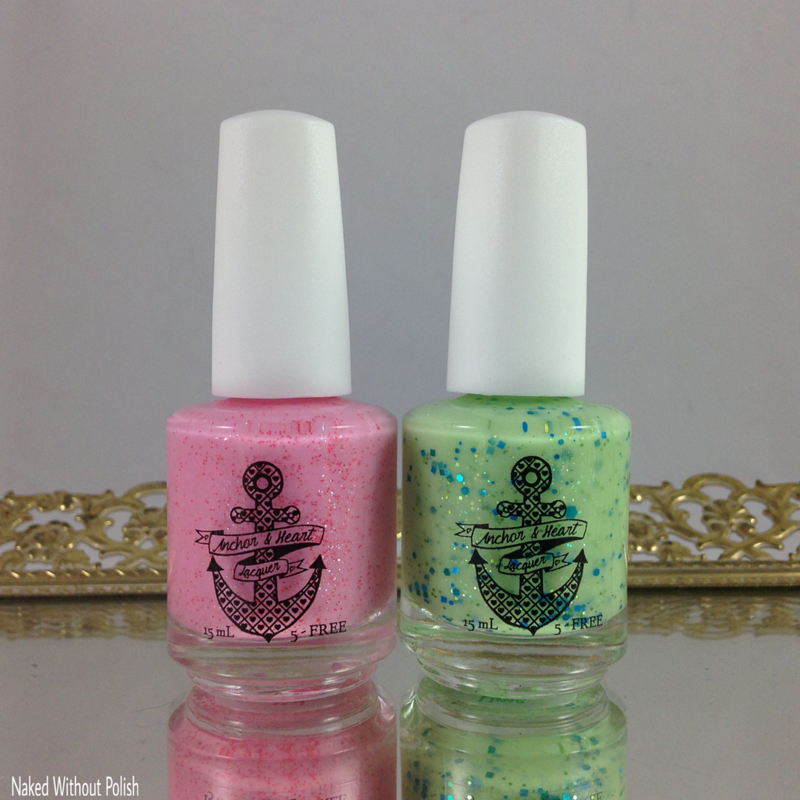 In addition to the the June duo, Anchor & Heart Lacquer is releasing two limited edition polishes. 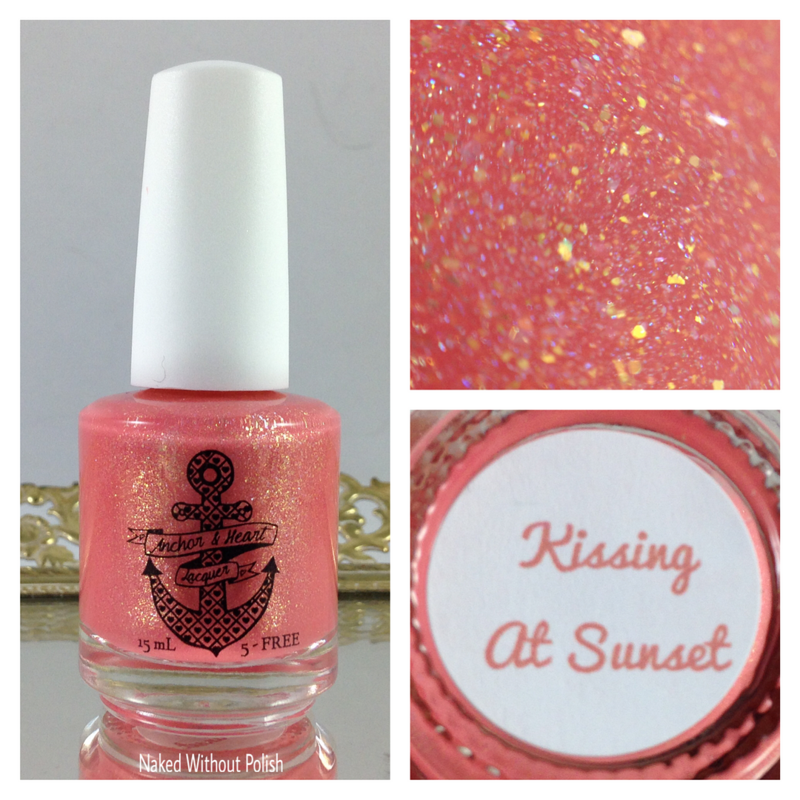 Kissing at Sunset is described as "a peachy orange holo with gold flecks". Shown is three thin coats of Kissing at Sunset with top coat. Kissing at Sunset is a must have for everyone! Not even a joke. The perfect shade for all skin tones. This polish breathes life into a dreary day. I couldn't stop smiling when I had it on. Smooth application and great formula. FLAWLESS! 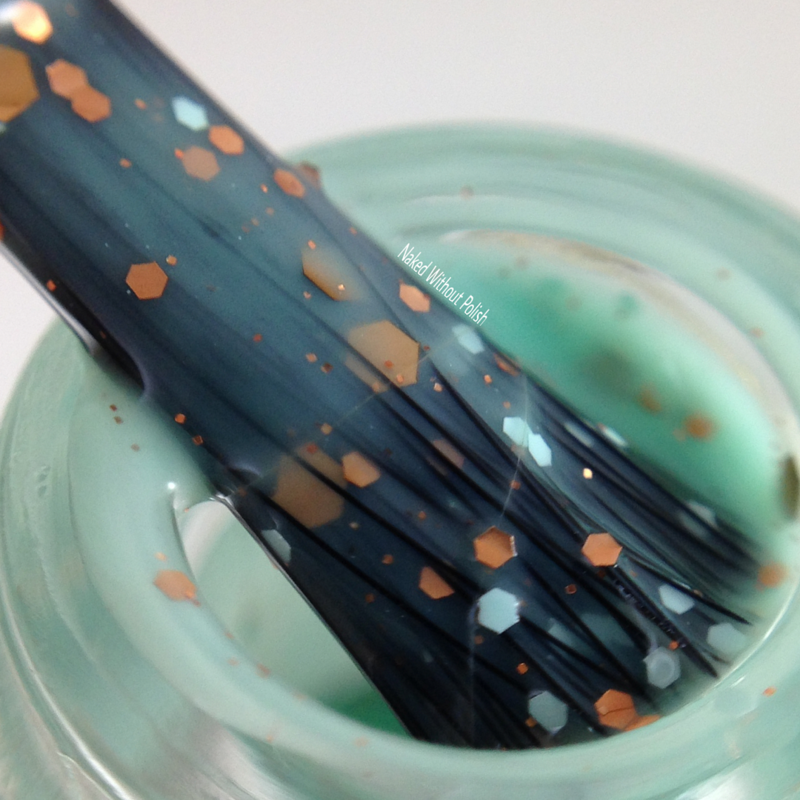 Echeveria is described as "mint leaning turquoise crelly with copper and bronze glitter in different sizes, and a dusting of small matte mint glitter". Shown is three thin coats of Echeveria with top coat. Echeveria caught my eye in her Facebook fan group. It was originally created as a custom for a giveaway. The winner loved it so much, she gave the go-ahead to share it with others. When Taryn messaged me to swatch it I had a mini Meg Ryan moment (think When Harry Met Sally...yeah, I had what she had). 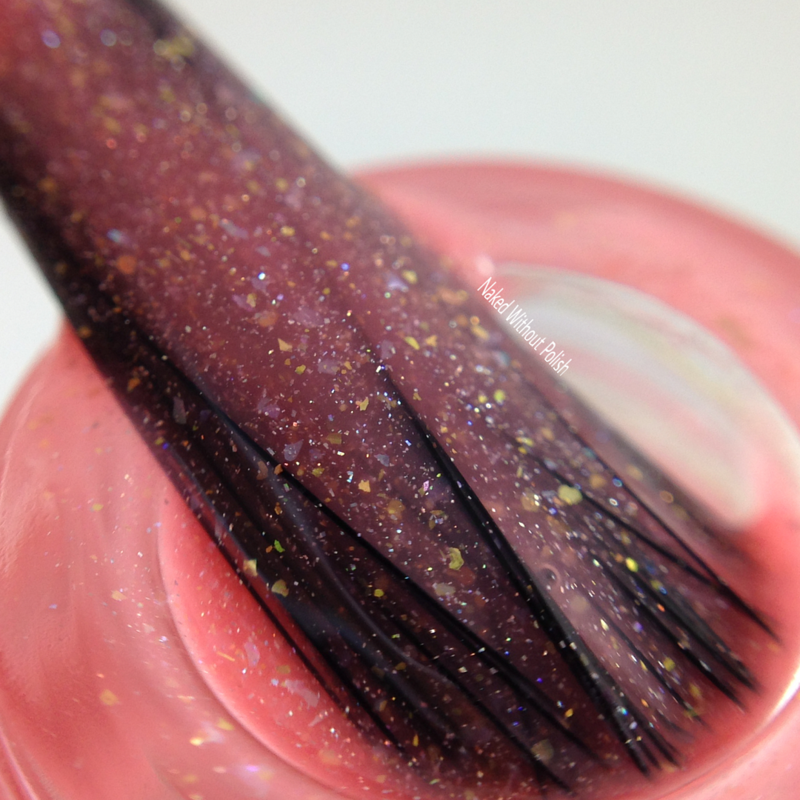 This color is everything, then you add these glitters and it turns into my new happy place. Yes, my happy place is now in this little bottle. I didn't have to fish for a single glitter. Each coat slid across my nail beautifully. A bit streaky at first (what crelly isn't? ), but smoothed out after the second and third coats. If you are a mint fiend, you need this! 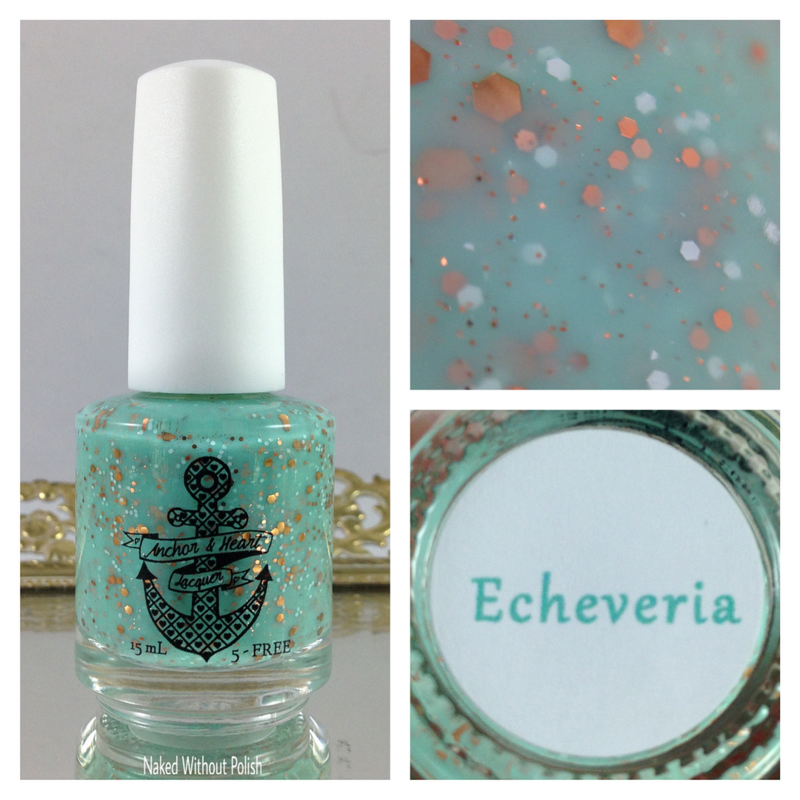 All of these will be available to purchase today, June 16th at 9 pm EST at www.anchorandheartlacquer.com. The Fan Favorites Duo will be sold as a set for $18 or individually for $9. 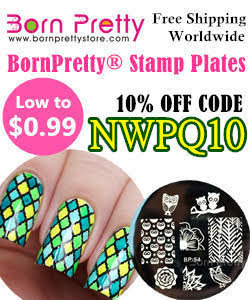 The two limited edition polishes will also be available but for $9.50. 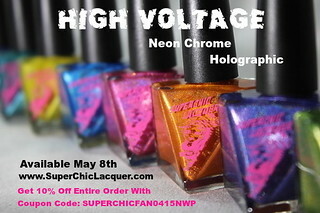 Oh, but wait... she is restocking some polishes as well! See! I told you it was a big day over at Anchor & Heart Lacquer. Make sure you are following them on all their social media platforms (links below) to stay updated on news, releases, and sales. What do you all think about the new polishes? Were you waiting on any of the restocks? I'm curious what you all will be picking up!